A manuscript carrying the number 770c in the Árni Magnússon collection in the Árni Magnússon Institute in Reykjavik, Iceland has a summary of "Erik the Red’s Saga". It is so brief that the events have become garbled, but it has the marks of a vivid folk tale. A few medieval records other than the Vinland sagas tell of Vinland, Markland, and Helluland. The earliest is from Bishop Adam of Bremen in Germany who visited Denmark in the late 1060s. There he was told of Vinland by the Danish king Sven Estridsson, who ruled between 1047 and 1074. Ari the Wise [Ári fróði, sometimes also translated Ari the Learned] knew of Vinland when he wrote his Book of Icelanders in the 1120s. Ari was conscientious with his sources and stated that he had tried in all cases to verify his information, most of which were oral. He provided the names of his informants and he consulted the oldest people he could find. His source for Greenland was his uncle Thorkell Gellison who himself had his information from an old man who had emigrated with Erik the Red. 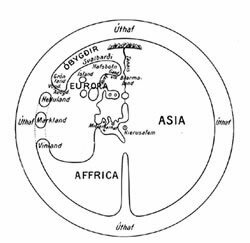 The most tantalizing reference to Vinland is from a one-line entry in the Icelandic Annals for the year 1121, which states that Bishop Erik Upsi Gnupsson [sometimes called Erik Gnupa] of Greenland went to visit or search for Vinland that year. The original parchments on which the Annals were recorded have been lost but several copies have been preserved so their content is well known. The Annals were annual records of important events, so the Bishop’s voyage must have been considered a major enterprise, but this one line is the only thing known about it. The last mention of voyages to the North American lands is an entry in the Annals for 1367, which speaks of a ship that had been to Markland. There are also several geographical descriptions in the Árni Magnússon collection, which mention Helluland, Markland, and Vinland, obviously with rather unclear notions of their locations.